Chan Fulton, Professor Emeritus of Biology at Brandeis, has been for many years a pioneer in using Naegleria gruberi, a single-cell eukaryote, as a research organism. 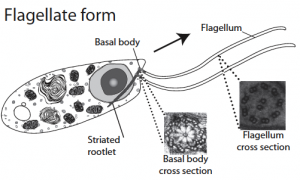 This eukaryote can differentiate from ameobae to swimming flagellates in response to environmental cues. In a paper published this week in Cell by Chan and his co-workers, the genome sequence of this organism is revealed and analyzed. The sequence information provides new insights into metabolic diversity (aerobic-anaerobic switching) in eukaryote evolution and in the early branching in the development of signalling pathways. Brandeis users can read the full text on the web.